Grand Canyon Superintendent Chris Lehnertz's attorney has advised her not to return to work until the National Park Service can guarantee her safety, the lawyer said in an interview with E&E News yesterday. Lehnertz's continuing absence is the latest twist in a string of accusations Lehnertz has faced in the last year. Recently, an underling charged that Lehnertz mishandled the discovery of three 5-gallon paint buckets filled with uranium at the park's museum collection building last year. "In large measure, it has to do with the continued barrage of malicious and defamatory statements that have been issued by another individual out there and that has made the process public — it's about the uranium situation," said Kevin Evans, Lehnertz's Denver-based attorney. "So my advice to her was that she not go back until this situation is resolved." In an email to his fellow employees last month, Elston "Swede" Stephenson, the park's health and wellness manager, said thousands of people were exposed to unsafe levels of radiation, and he accused the Park Service of trying to cover up a "a top management failure." Lehnertz, who took over as superintendent in 2016, was in charge of the park when the uranium was discovered. 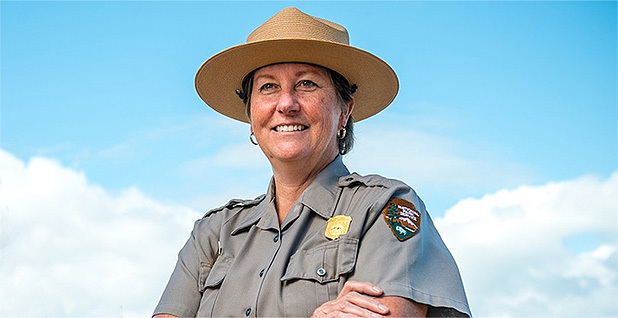 Evans called the allegations against his client "ridiculous" but said the Department of the Interior and NPS officials need to take "appropriate action" before she resumes her duties as superintendent. "I just didn't feel under the circumstances that it was a conducive environment for Chris to return and — quite frankly, given the flippant comments that this individual continues to make — for her safety," Evans said. Lehnertz was officially cleared this week of any wrongdoing in a separate investigation of allegations that she had created a hostile work environment for senior leaders, particularly men, and that she had wasted $180,000 on renovations for a park residence (E&E News PM, March 5). The Interior Department's Office of Inspector General released its final report on Tuesday, saying the charges made against Lehnertz were unfounded. Lehnertz was reassigned when the probe began in October. When the Park Service publicly announced her transfer, it offered no reasons for what had prompted the investigation. "I have remained insistent from Day One that she should not have been removed from the park," Evans said. "The action they took was improper. ... It injured and harmed her stellar reputation, and how do you get that back? So I have a significant beef with her superiors. There was no reason to handle it this way, and we can all speculate as to why that happened." After concluding the four-month probe into Lehnertz last month, the Park Service sent another team of investigators to Grand Canyon to examine whether park officials had acted appropriately after the uranium was discovered last year. In his email, Stephenson said the containers of uranium were close to a taxidermy exhibit visited by children on tours. And he said that anyone who had been in the park's Museum Collection building between 2000 and June 18, 2018, had been "exposed" to uranium, as defined by the Occupational Safety and Health Administration. While no findings of that investigation have been announced, NPS officials said last month that a preliminary inquiry had already found that there was no danger to the public. Mike Litterst, chief spokesman and acting chief of public affairs for NPS, said the agency could not provide any information on personnel actions. "We do not have any details to share nor a timeline regarding Superintendent Lehnertz's return to the park," he said. Evans said he's hoping his negotiations with NPS and the Interior Department are wrapped up by next week. "I hope to be sitting here a week from now with a signed settlement agreement, but we're not there yet," he said. "And we are insisting that the settlement agreement, if and when we reach it, is not confidential, so it'll be a public document, available for dissemination."